Hello Chronotrader people, here is a top and very rare watch that just landed. Outstanding condition, probably the best you can get for this model. As always, use discount code CHRONOTRADER at checkout to get a 5% discount. Follow the link for more pics and to check our latest arrivals, I have also a couple of Speedies (incl. Straight Writing), a more classic Yachtingraf, a striking 1016 and many other to come. This is one of the best examples of an extremely rare watch. 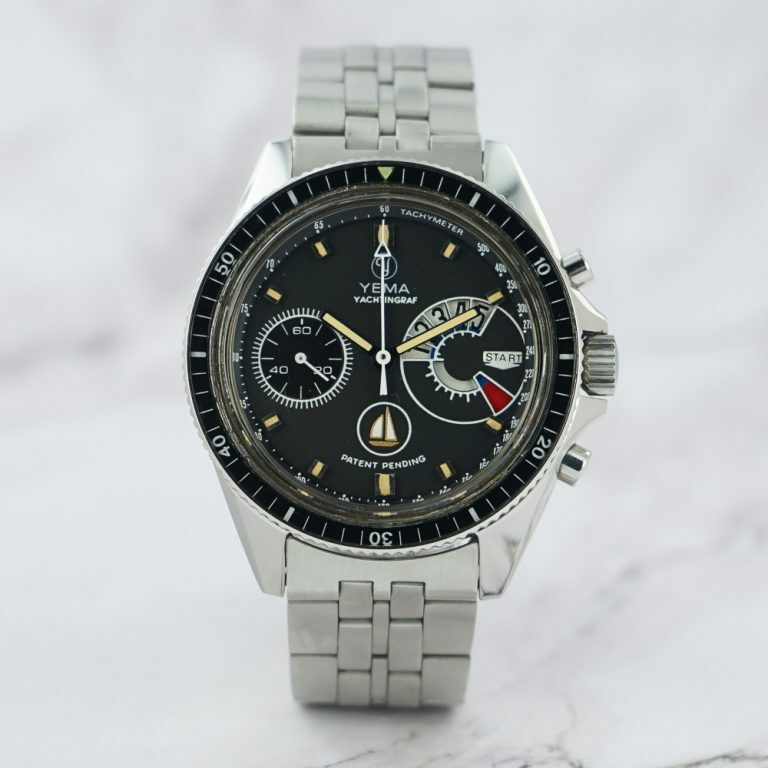 From 1969, Yema produced a handful of regatta chronographs featuring a 10 minutes countdown instead of the traditional second chronograph disc. Based on a modified Valjoux 7733, these watches were produced in the strong and distinctive 850737 Yema case, thick, large (42mm) and with beautifully designed crown-guards. It is commonly admitted that only 25 of them are known, which makes it a very hard catch. And as you will admit that the condition of the example we are offering is simply outstanding, we are not afraid to say that this one is among the bests, if not the best, examples out there. Analog/Shift listed one recently for $8700 (far worse condition) and the last one sold on Ebay (and avertised here) went for more than $7600. The watch is in outstanding condition. The very nice matte black dial is perfect, showing a crazy patina of the original lume (UV tested), perfectly matching the square hands. The rotating bezel is in very nice condition and rotates freely as it should. The case looks excellent. It comes on a vintage NOS steel bracelet. Asking 6500€ shipped for this beast, so roughly 6200€ with the discount code. The watch is in France.